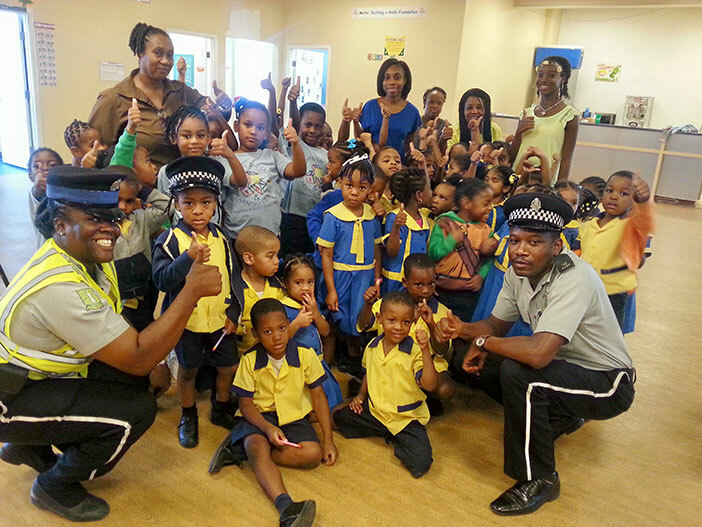 Friday, March 4 – Officers of the RVIPF are making their rounds through some of the pre-primary and primary schools this week as some read and others encourage students to be respectful, courteous and law abiding as part of activities to mark Police Week. Chief Inspector Dennis Jones, who was one of the officers participating, noted the benefits of engaging this age group while they are still forming their opinions about themselves, their peers and those in authority. “This pre-primary and primary age group is really the ideal age for us to engage while they are forming the right attitudes toward law enforcement and enforcers. It is important that the characterization not only of law enforcers but teachers and principals remain positive and respectful. This, of course, would have to be also reinforced at home.” says Chief Inspector Jones who is in charge of the Eastern and Western Neighbourhood Policing Divisions. The RVIPF is also reaching out to community through its new RVIPF website. Acting Commissioner of Police Alwin James used the Police Week celebrations to launch the Force’s new, more attractive and functional website www.rvipolice.vg. In presenting the new website, the Acting Commissioner noted that the updated website has all the police application forms for employment, reports, certificates and visa waivers in a printable format eliminating the need to obtain these forms at the Road Town Police Station when making applications. “All our press releases, police-related legislation and policies and even crime prevention videos are available on the site. Our press releases will also be published on our Facebook page and twitter page,” he said.